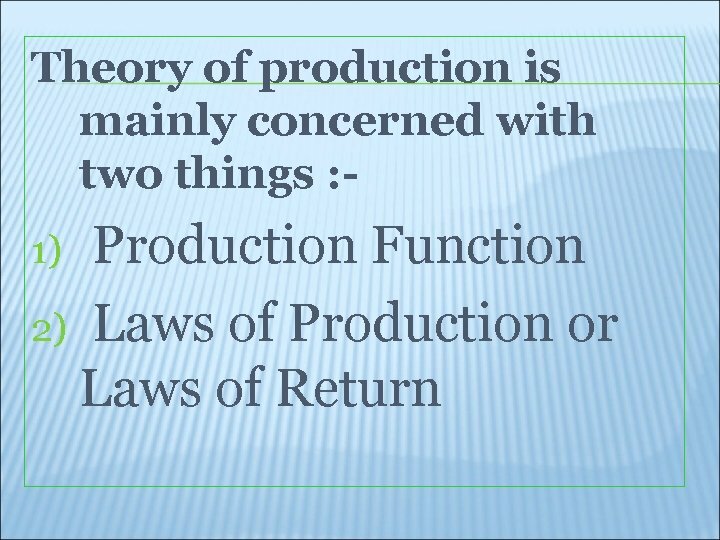 WHAT IS THEORY OF PRODUCTION ? 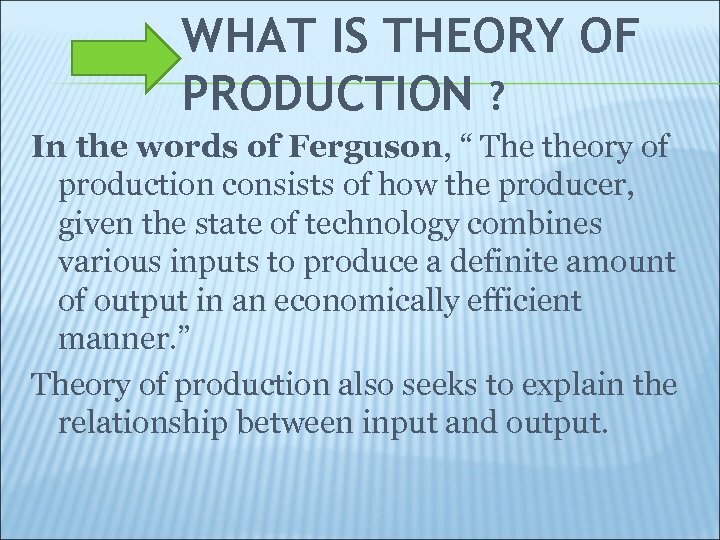 In the words of Ferguson, “ The theory of production consists of how the producer, given the state of technology combines various inputs to produce a definite amount of output in an economically efficient manner. ” Theory of production also seeks to explain the relationship between input and output. 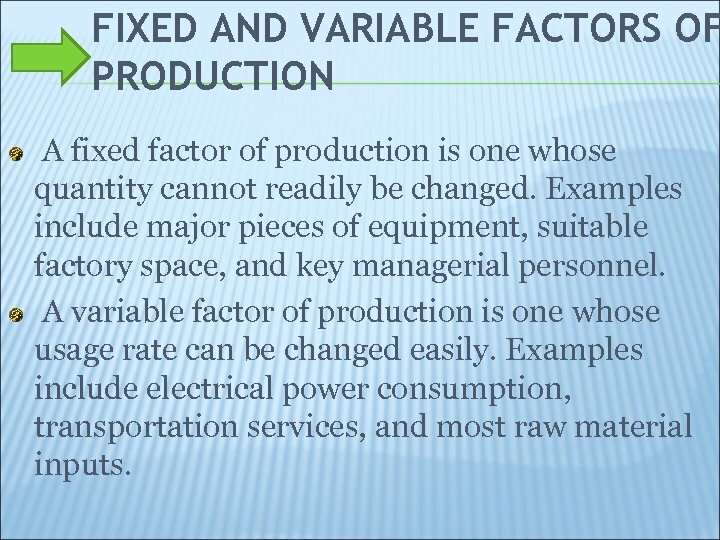 FIXED AND VARIABLE FACTORS OF PRODUCTION A fixed factor of production is one whose quantity cannot readily be changed. Examples include major pieces of equipment, suitable factory space, and key managerial personnel. A variable factor of production is one whose usage rate can be changed easily. Examples include electrical power consumption, transportation services, and most raw material inputs. LAW OF VARIABLE PROPORTION The law of variable proportions states that as the quantity of one factor is increased, keeping the other factors fixed, the marginal product of that factor will eventually decline. 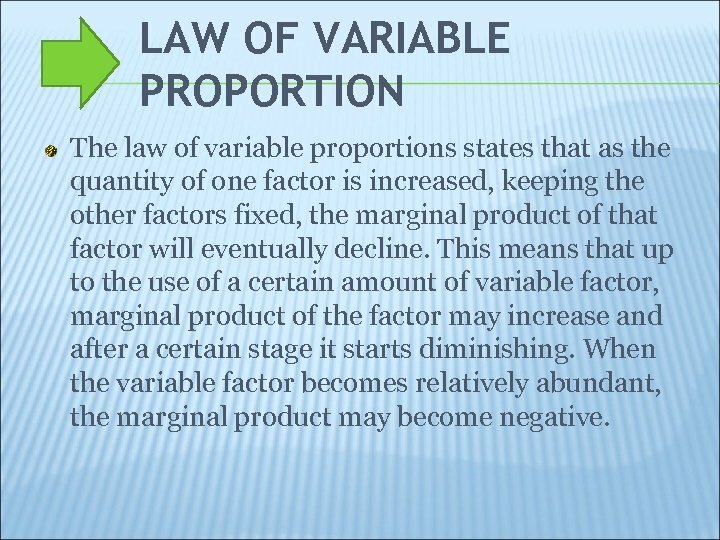 This means that up to the use of a certain amount of variable factor, marginal product of the factor may increase and after a certain stage it starts diminishing. When the variable factor becomes relatively abundant, the marginal product may become negative. 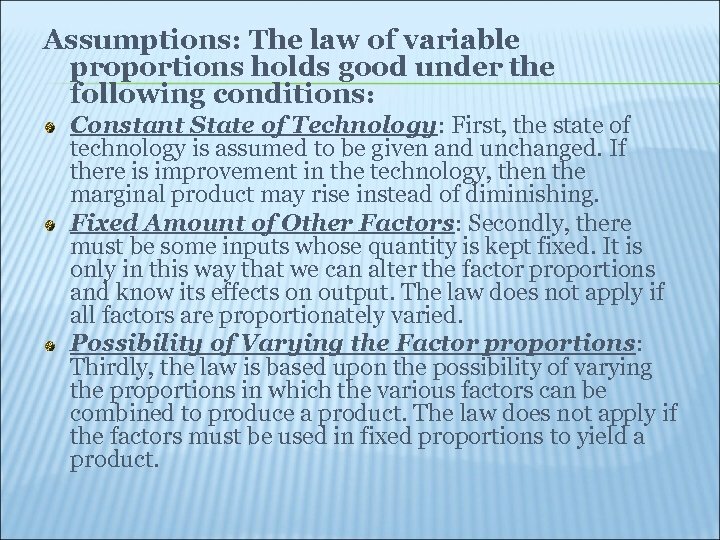 Assumptions: The law of variable proportions holds good under the following conditions: Constant State of Technology: First, the state of technology is assumed to be given and unchanged. If there is improvement in the technology, then the marginal product may rise instead of diminishing. Fixed Amount of Other Factors: Secondly, there must be some inputs whose quantity is kept fixed. It is only in this way that we can alter the factor proportions and know its effects on output. The law does not apply if all factors are proportionately varied. 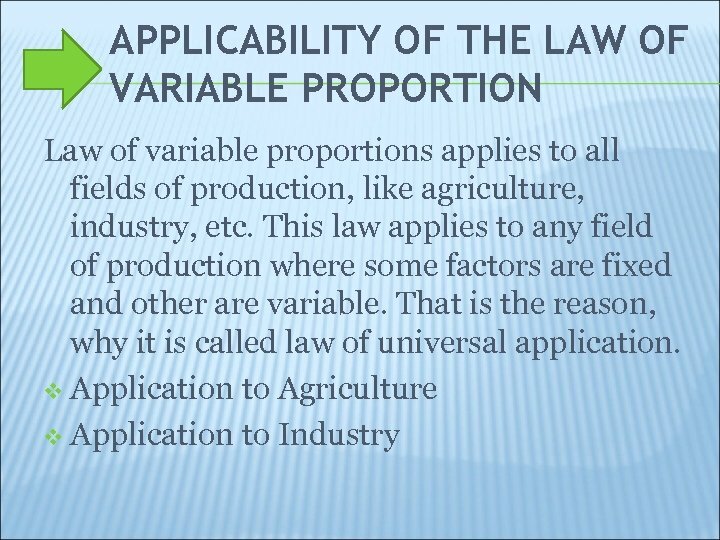 Possibility of Varying the Factor proportions: Thirdly, the law is based upon the possibility of varying the proportions in which the various factors can be combined to produce a product. The law does not apply if the factors must be used in fixed proportions to yield a product. 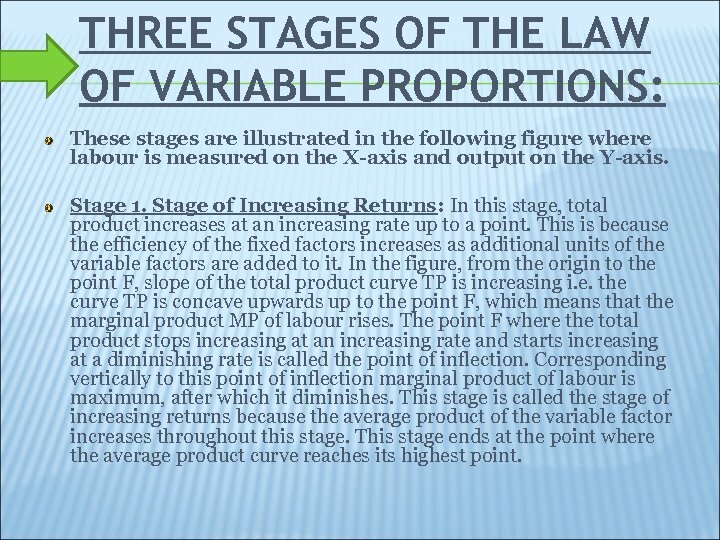 THREE STAGES OF THE LAW OF VARIABLE PROPORTIONS: These stages are illustrated in the following figure where labour is measured on the X-axis and output on the Y-axis. Stage 1. Stage of Increasing Returns: In this stage, total product increases at an increasing rate up to a point. This is because the efficiency of the fixed factors increases as additional units of the variable factors are added to it. In the figure, from the origin to the point F, slope of the total product curve TP is increasing i. e. the curve TP is concave upwards up to the point F, which means that the marginal product MP of labour rises. The point F where the total product stops increasing at an increasing rate and starts increasing at a diminishing rate is called the point of inflection. Corresponding vertically to this point of inflection marginal product of labour is maximum, after which it diminishes. This stage is called the stage of increasing returns because the average product of the variable factor increases throughout this stage. This stage ends at the point where the average product curve reaches its highest point. Stage 2. Stage of Diminishing Returns: In this stage, total product continues to increase but at a diminishing rate until it reaches its maximum point H where the second stage ends. 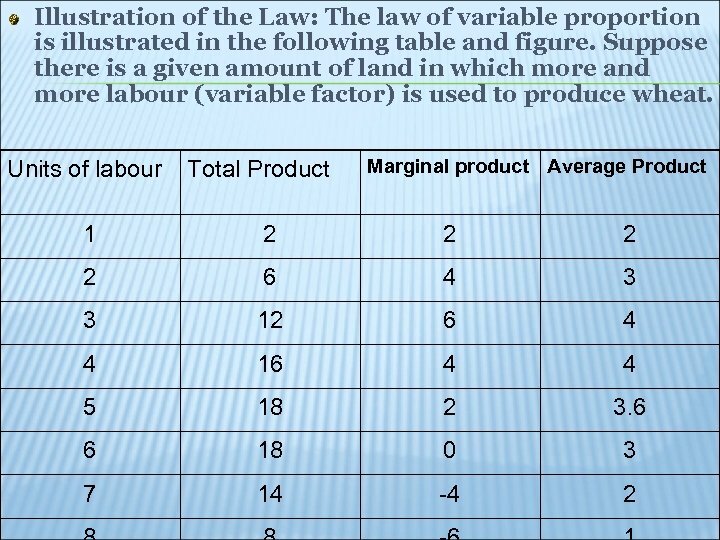 In this stage both the marginal product and average product of labour are diminishing but are positive. This is because the fixed factor becomes inadequate relative to the quantity of the variable factor. At the end of the second stage, i. e. , at point M marginal product of labour is zero which corresponds to the maximum point H of the total product curve TP. This stage is important because the firm will seek to produce in this range. Stage 3. 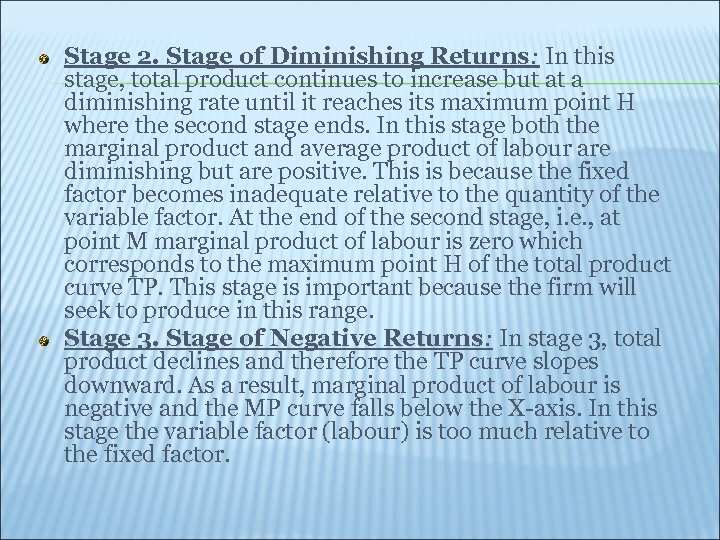 Stage of Negative Returns: In stage 3, total product declines and therefore the TP curve slopes downward. 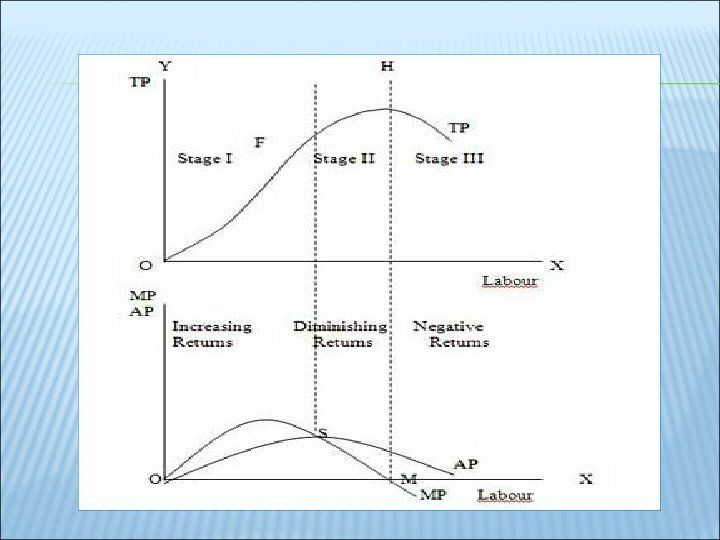 As a result, marginal product of labour is negative and the MP curve falls below the X-axis. In this stage the variable factor (labour) is too much relative to the fixed factor. 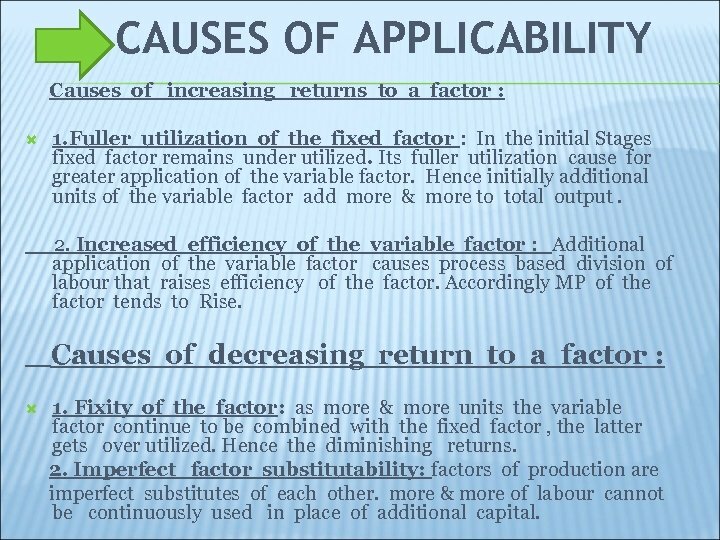 CAUSES OF APPLICABILITY Causes of increasing returns to a factor : 1. Fuller utilization of the fixed factor : In the initial Stages fixed factor remains under utilized. Its fuller utilization cause for greater application of the variable factor. Hence initially additional units of the variable factor add more & more to total output. 2. Increased efficiency of the variable factor : Additional application of the variable factor causes process based division of labour that raises efficiency of the factor. Accordingly MP of the factor tends to Rise. Causes of decreasing return to a factor : 1. Fixity of the factor: as more & more units the variable factor continue to be combined with the fixed factor , the latter gets over utilized. Hence the diminishing returns. 2. 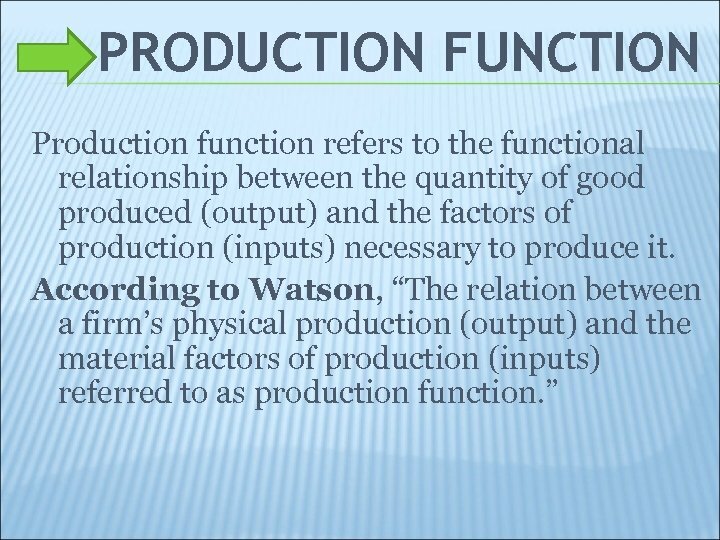 Imperfect factor substitutability: factors of production are imperfect substitutes of each other. more & more of labour cannot be continuously used in place of additional capital. 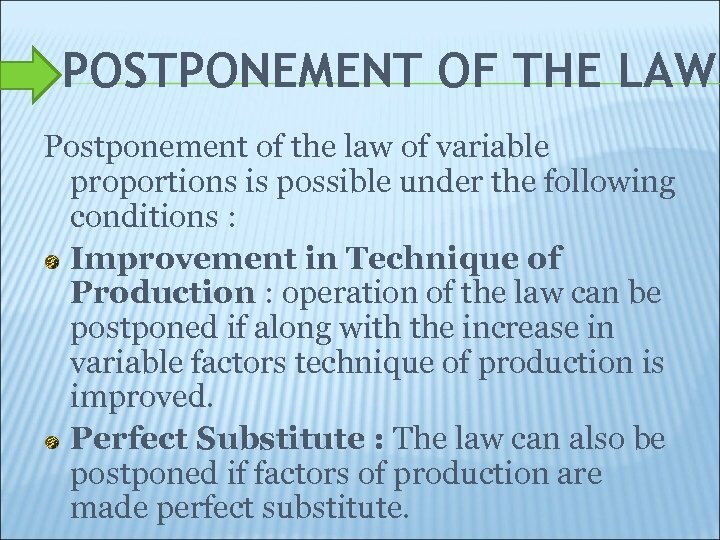 POSTPONEMENT OF THE LAW Postponement of the law of variable proportions is possible under the following conditions : Improvement in Technique of Production : operation of the law can be postponed if along with the increase in variable factors technique of production is improved. Perfect Substitute : The law can also be postponed if factors of production are made perfect substitute. (I) Technical Economies: When production is carried on a large scale, a firm can afford to install up to date and costly machinery and can have its own repairing arrangements. As the cost of machinery will be spread over a very large volume of output, the cost of production per unit will therefore, be low. A large establishment can utilize its by products. This will further enable the firm to lower the price per unit of the main product. A large firm can also secure the services of experienced entrepreneurs and workers which a small firm cannot afford. In a large establishment there is much scope for specialization of work, so the division of labor can be easily secured (ii) Managerial Economies: When production is carried on a large scale, the task of manager can be split up into different departments and each department can be placed under the supervision of a specialist of that branch. The difficult task can be taken up by the entrepreneur himself. Due to these functional specialization, the total return can be increased at a lower cost. 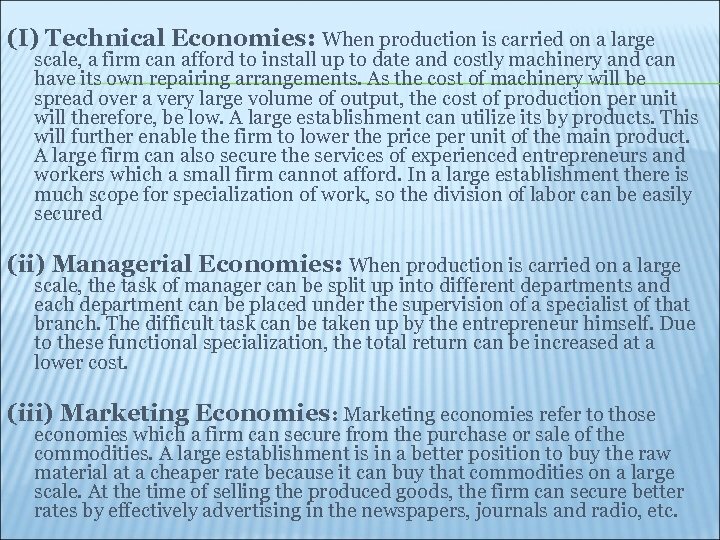 (iii) Marketing Economies: Marketing economies refer to those economies which a firm can secure from the purchase or sale of the commodities. A large establishment is in a better position to buy the raw material at a cheaper rate because it can buy that commodities on a large scale. At the time of selling the produced goods, the firm can secure better rates by effectively advertising in the newspapers, journals and radio, etc. (iv) Financial Economies: Financial economies arise from the fact that a big establishment can raise loans at a lower rate of interest than a small establishment which enjoys little reputation in the capital market. 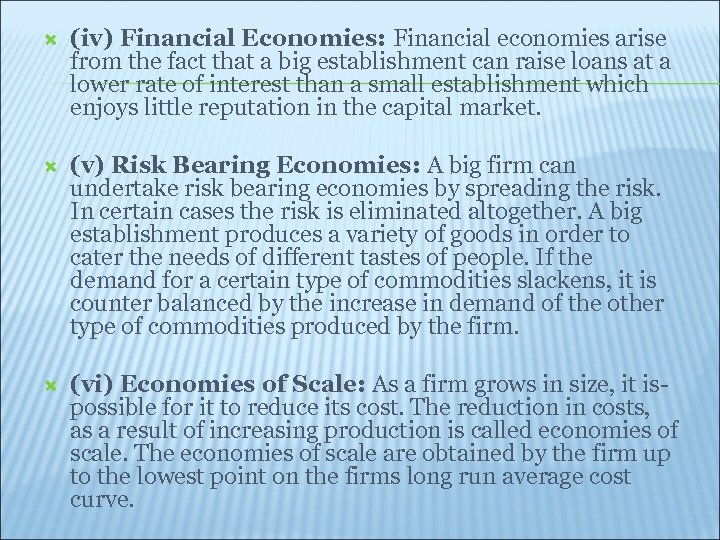 (v) Risk Bearing Economies: A big firm can undertake risk bearing economies by spreading the risk. In certain cases the risk is eliminated altogether. A big establishment produces a variety of goods in order to cater the needs of different tastes of people. If the demand for a certain type of commodities slackens, it is counter balanced by the increase in demand of the other type of commodities produced by the firm. 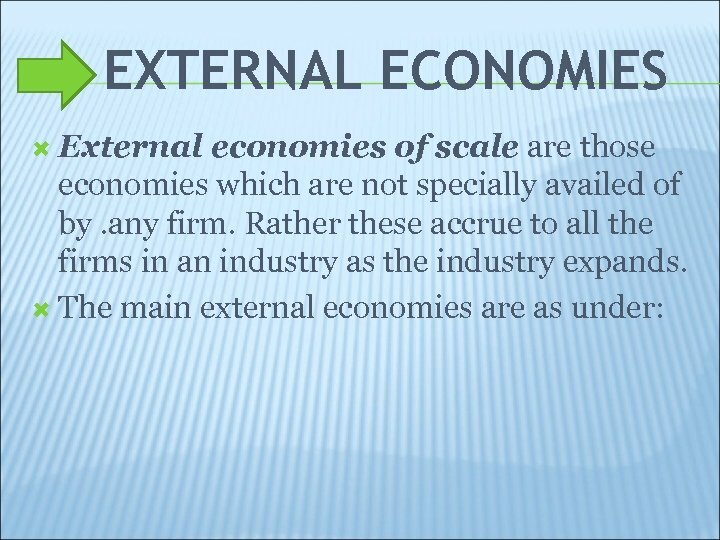 (vi) Economies of Scale: As a firm grows in size, it ispossible for it to reduce its cost. 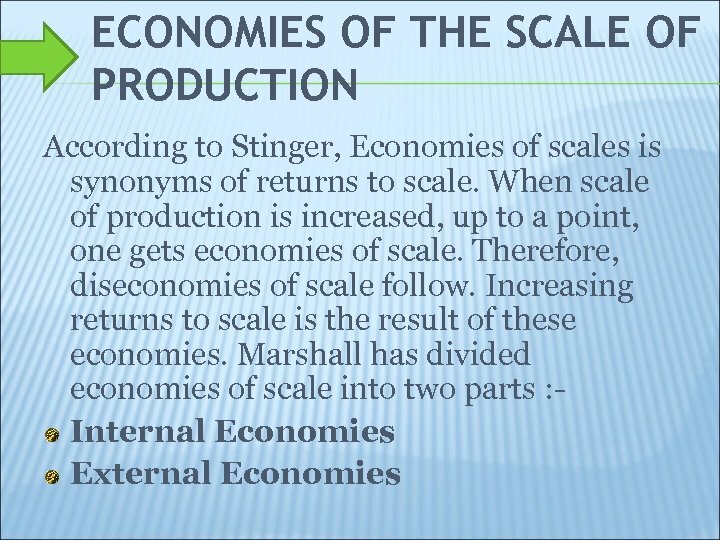 The reduction in costs, as a result of increasing production is called economies of scale. 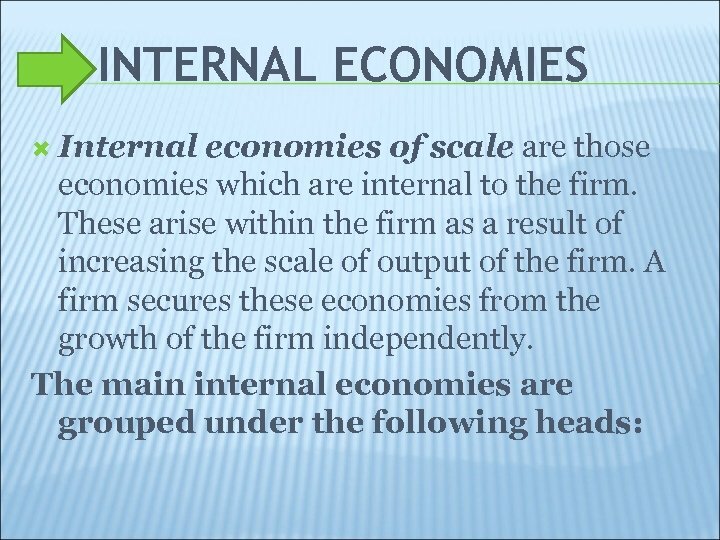 The economies of scale are obtained by the firm up to the lowest point on the firms long run average cost curve. 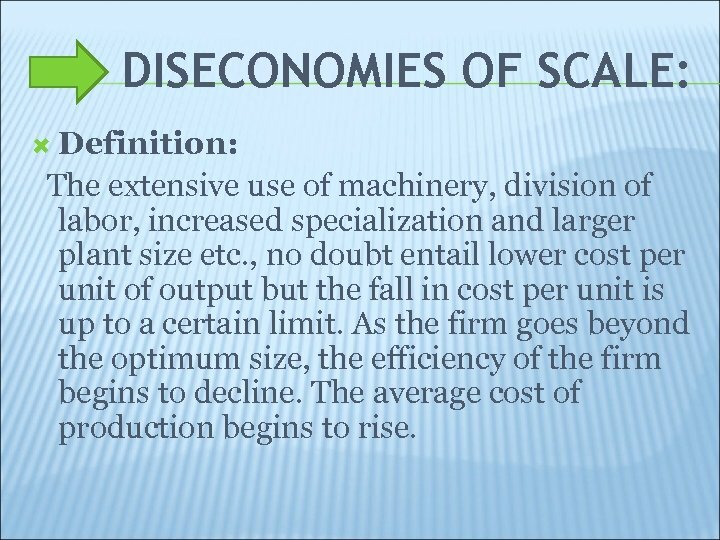 DISECONOMIES OF SCALE: Definition: The extensive use of machinery, division of labor, increased specialization and larger plant size etc. , no doubt entail lower cost per unit of output but the fall in cost per unit is up to a certain limit. As the firm goes beyond the optimum size, the efficiency of the firm begins to decline. The average cost of production begins to rise. FACTORS OF DISECONOMIES: (I) Lack of co-ordination. As a firm becomes large scale producer, it faces difficulty in coordinating the various departments of production. The lack of co-ordination in the production, planning, marketing personnel, account, etc. , lowers efficiency of the factors of production. The average cost of production begins to rise. (ii) Loose control. As the size of plant increases, the management loses control over the productive activities. The misuse of delegation of authority, the redtapisim bring diseconomies and lead to higher average cost of production. (iii) Lack of proper communication. The lack of proper communication between top management and the supervisory staff and little feed back from subordinate staff causes diseconomies of scale and results in the average cost to go up. (iv) Lack of identification. In a large organizational structure, there is no close liaison between the top management and the thousands of workers employed in the firm. The lack of identification of interest with the firm results in the per unit cost to go up. (I) Economies of localization. When an industry is concentrated in a particular area, all the firms situated in that locality avail of some common economies such as (a) skilled labor, (b) transportation facilities, (c) post and telegraph facilities, (d) banking and insurance facilities etc. (ii) Economies of vertical disintegration. The vertical disintegration implies the splitting up the production process in such a manner that some Job are assigned to specialized firms. For example, when an industry expands, the repair work of the various parts of the machinery is taken up by the various firms specialists in repairs. (iii) Economies of information. As the industry expands it can set up research institutes. The research institutes provide market information, technical information etc for the benefit of alt the firms in the industry. 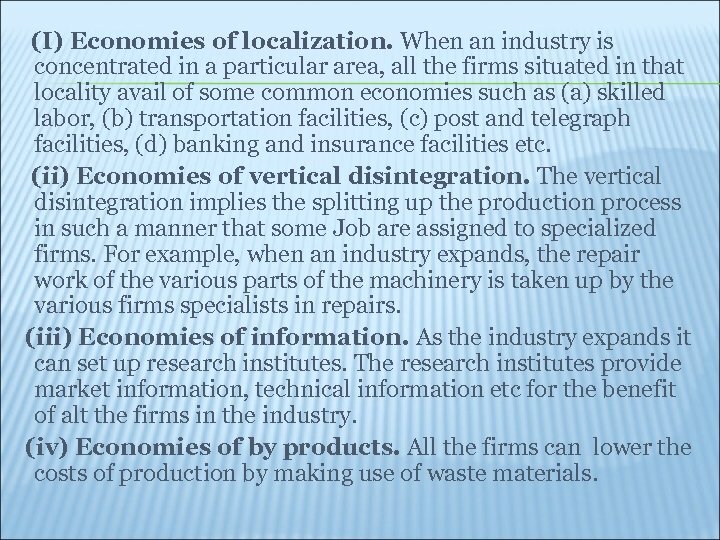 (iv) Economies of by products. All the firms can lower the costs of production by making use of waste materials. 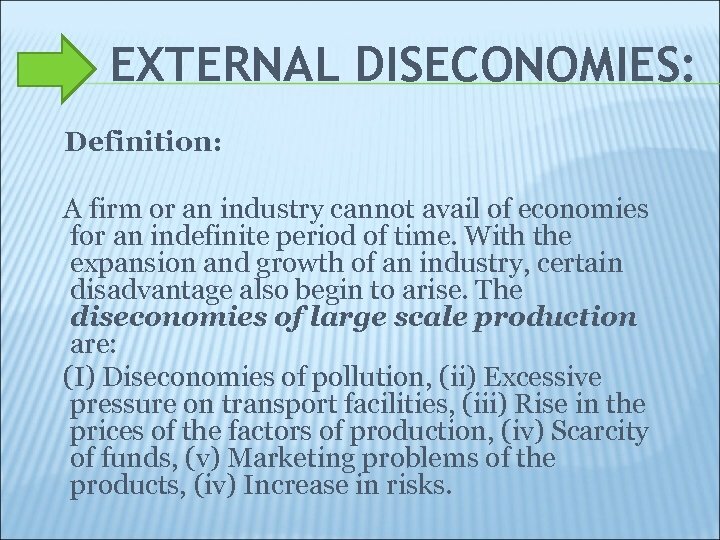 EXTERNAL DISECONOMIES: Definition: A firm or an industry cannot avail of economies for an indefinite period of time. With the expansion and growth of an industry, certain disadvantage also begin to arise. 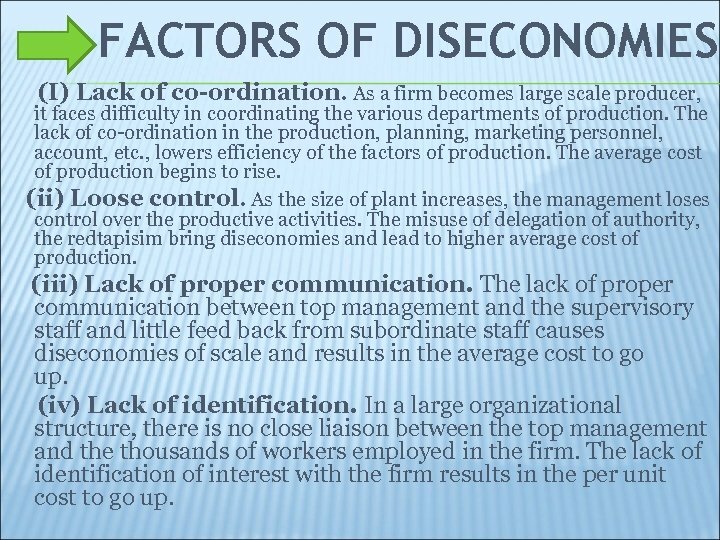 The diseconomies of large scale production are: (I) Diseconomies of pollution, (ii) Excessive pressure on transport facilities, (iii) Rise in the prices of the factors of production, (iv) Scarcity of funds, (v) Marketing problems of the products, (iv) Increase in risks.